Everyone hopes for a year of smooth sailing, with an exceptional staff and an appreciative community. That rarely matches reality. Sometimes a curveball changes the program. It could be planned or hit you out of nowhere. Advisers who faced drastic culture shifts in their classroom offered sound advice. After 11 years, Jai Tanner had “a beautiful running machine” of a yearbook in El Paso, Texas. She figured she could apply the same principles that made her successful in Texas to the Yelm High School yearbook in Yelm, Washington, when she moved. She quickly realized Washington has its own way. “They are extremely devoted to their school colors and their mascot,” Tanner said. In Texas, school colors were not a priority. She wasn’t prepared for the significance placed on colors as a part of school identity. When her editor wanted to go a less traditional route, it did not go over that well. Rather than get defensive or try to change the school, Tanner recognized an important concept. Erin DeVantier and Kaitlin Curcio faced challenges when DeVantier decided to introduce more writing to the yearbook at Williamsville North High School in Williamsville, New York. That’s when she recruited Curcio, the new English teacher, to aid in the journalistic side. Their approach was not immediately well-received, with parents telling her the book was ruined. They stayed focused on what they thought was valuable: captioning photos and including stories. The building for Davie County High School in Mocksville, North Carolina, no longer met the school’s needs. Michelle Shue knew the community understood, but letting go made unique challenges creating the last yearbook of the old building – the bookend of their school experience, as she refers to it. Former students mourned that future generations would never walk the same halls their family had. DeVantier and Curcio confess the negative feedback got to them more than they admitted. Support from their principal made a huge difference. He handled most parent responses, taking a huge burden off them, and encouraged them to keep going. “One big thing is to involve other adults in the building to make sure you have people on your side and ready to support your students,” Curcio said. The support also came from unexpected places. Farhana Hoque wanted her book to reflect the diversity of Midwood High School, in Brooklyn, New York. She did not always find that reflected in their yearbook. She made a goal of inclusivity, even if that meant working harder for their content. Key decisions made the yearbook more inclusive. Hoque made a point to include cultural events in the yearbook. It’s a great photo opportunity and might include students not involved in other activities. Next, she focused on creating an environment where her staff reached outside their social circles. Technology plays a large role. The staff posts on social media for pictures, and broadening the pool of resources increases their diversity. Beyond the external sources, getting the staff on board was vital. Camp was a common way to accomplish this. Shue credits camp with preparing a young, inexperienced staff and now goes every year. DeVantier and Curcio agree that camp is a game changer and helped get their students on board. They recall being shocked at their first Camp Orlando by how big yearbook is in Texas and Florida. When they took over, it was just a club with two or three students. Another important consideration? Have the right editors in place. That may mean diversifying your staff in terms of representation, adding new editors to reflect new interests or recruiting outside talent. “When I’m accepting students in the yearbook class, I know that I want culturally conscious students, and also students of male and female genders,” Hoque said. Hoque prides herself on greater male representation on staff after starting with only one to two. She recruited males who hung out in the yearbook office, then asked them to bring their friends to the office. She jokes that she begged, but eight guys joined. Curcio and DeVantier found portions of their student body underrepresented. They had a large sports section, but parents commented they have as many kids in music without the same coverage devoted. With a young staff on her hands, Shue searched for editors outside of her yearbook pool. Shue lets her staff focus on their interests to develop skills. DeVantier and Curcio knew for students to embrace the change, they had to be in the book. DeVantier and Curcio rebranded a popular sports local slogan for their theme, selling clothing and creating posters. Shue’s staff sold over 500 T-shirts, and not just to students. Seeing the shirts in the community heightened awareness of their book while recognizing the nostalgia of the original building. The staff captured the school’s legacy through old yearbook photos. 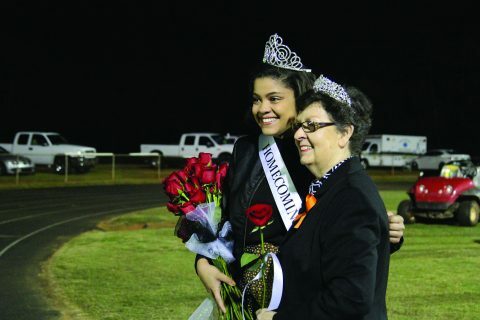 A photo of their first Davie County homecoming queen sparked a photo idea. Shue’s staff pointed to their history of change, from changing their mascot to racially integrating before it was legally required, something Shue reminded them was rather forward-thinking for that time. The nods to history was a decision that paid off. Tanner found it’s easy to compare, even unintentionally, and that adjusting takes time. Curcio found, given time, the student body came around. “When we made our ‘One North’ book that won the CSPA Crown, we actually got no negative feedback from it, but it still had all those journalistic qualities that our first book did. So we are in the belief that our student body has grown to appreciate it because I only heard positive feedback,” Curcio said. Human nature wants to be in control, but it’s not possible. The ladder Shue and her staff put together was completely rearranged due to weather. Homecoming split into three separate weeks because North Carolina experienced two major hurricanes and heavy rain cancelled games so spring sports were reduced to single pages. “Anticipate that these beautiful plans are going to look like a hot mess of good intentions by the end of it all, because it truly is a book about a year,” Shue said. Tanner accepted some changes were out of her control. Living in a military community meant it would be more transient, making it harder to establish a program and find editors. She also learned some changes were within her control. For most, the rewards of yearbook, such as the student relationships formed, outweigh the stress. Even though Hoque had no yearbook experience, she is happy the yearbook program fell into her lap.